Banding pelicans on Gunnison Island is quite an adventure. THE DAY HAD finally arrived. After several years of listening to stories from co-workers who had made the trip, it was my turn to accompany the Great Salt Lake Ecosystem Program biologists on their annual trip to Gunnison Island for the pelican roundup. Biologists capture the flightless, young pelicans and outfit them with a leg band and wing markers to aid field identification of pelicans after they reach maturity and go their separate ways. During my career I’ve assisted with hundreds of surveys and handled nearly every type of critter in Utah. One exception is the American white pelican. Maybe the chance to handle something new is what made it so easy to climb out of bed at 3:00 a.m. to begin the mid-July day. Since 2011, we have corralled, banded and tagged 2,141 juveniles on Gunnison Island in Great Salt Lake. I’ve viewed the Great Salt Lake a place of solitude and mystery since my teenage years. Every year as I’d sit atop the peaks of the Promontory Range glassing for mule deer, my thoughts would invariably turn to the gigantic, blue expanse to the west of the rocky ridge I was sitting on and I’d wonder what was on those islands so far out in the middle of the big body of water. I’ve always had a thing for remote places, and Gunnison Island certainly fits that category. To put it into perspective, more people climbed Mount Everest last year than set foot on Gunnison Island. The day started early. We met the crew at 5:30 to ensure we had enough time to complete our work and depart the island before the parents returned from their daily feeding trip to the marshes along the east side of the Great Salt Lake. As I stepped off the boat, onto the salt-crusted rocks of Gunnison Island, I noted that the island was very different from Antelope Island, where I’d spent many days observing the abundant wildlife found there. The sheer remoteness of its location is what makes it so desirable as a nesting area for birds. Salt-encrusted rocky shoreline of Gunnison Island. Once everyone was on shore, John Luft — Great Salt Lake Ecosystem Program Manager — quickly made assignments and gave us a run-down of the process. A half-dozen of the more fleet-footed and experienced crew members would hustle up the back side of the ridge we were sitting beneath to cut off the escape of the unsuspecting pelicans while the rest of us would pack the trap and banding equipment and hustle around the eastern shore of the island, to prevent the birds from heading out to open water. If all went well, we’d have them corralled within a half hour, so banding would be completed before the parents returned with breakfast for the pelican chicks. And so the plan was put in motion. As we made our way around the eastern shore, I observed numerous skeletons of birds that hadn’t survived for various reasons. There were carcasses of nearly every species of waterfowl, as well as gulls, grebes and pelicans. It really is survival of the fittest out here! As the ridge crew topped out, the birds huddled up and began moving south to get away from the intruders in what can only be described as a low-speed stampede! Biologist John Neill reacted quickly. He hustled out across a large mudflat to get ahead of the birds and cut off their escape. Given the size of the flock (over 400 birds), I thought he could use some help, so I went with him. After we made the 200 yard trek across the playa, I looked up to see how far the birds had gone. They hadn’t moved more than 20 yards! The process worked like a well-oiled machine. As we pushed the birds down out of the brush, the flanking crew quickly set up a makeshift corral. Once the birds were contained, “Banders” were supplied with pliers, leg bands and wing tags. “Catchers” entered the corral and brought individual birds to the “holders.” Holders are charged with the toughest part of this operation. They are tasked with securing the birds so the banders can install a leg band on the left leg and patagial markers on each wing. Not as easy as it sounds, when you consider that they have to hold the 15-pound bird securely, so wings and legs are not injured. They also have to hold the pelican’s bill so it can’t bite anyone. Pelicans can’t breathe if their mouth is closed completely, so the holder has to keep a couple fingers inside the pelican’s mouth and a couple fingers holding the bill so it can’t snap at your face. That’s a lot to keep track of with only two hands! This is best accomplished with a strange-looking pelican hug. While we’re trying to learn this technique, you’re also trying to ignore the dust and smell that arises from 400 birds stomping around in a tight circle. A Gunnison Island pelican receiving its green wing tag. All in all, the process went well. In 90 minutes we had banded more than 300 birds. Some adult birds began showing up, so we scuttled the operation, released the remaining birds and packed up the corral for the long trek back to the boats. It’s critical that the adults don’t get agitated, or they will regurgitate the food intended for the chicks before they locate their offspring and the food will be wasted. This could easily result in dehydration and death of the young pelicans. On the boats, as we made our way back across the lake, we watched as flock after flock of adult pelicans passed overhead, on their way back to Gunnison Island with a fresh sushi breakfast for the little ones. I couldn’t help but reflect on what a strange and complicated survival strategy we had just witnessed. You can watch a TV story from KSL Outdoors about this banding trip to Gunnison Island. The pelican story begins at the 11:35 minute mark. Pelicans have selected Gunnison Island as a nesting site for its remoteness, lack of predators and its proximity to a reliable food source. Historical records indicate that pelicans used to nest in several other locations in the lake, and Utah Lake, but those efforts were abandoned over the years due to disturbances during nesting season. In 2005, Gunnison Island was designated as a wildlife management area with restricted access to protect the nesting birds using the island. 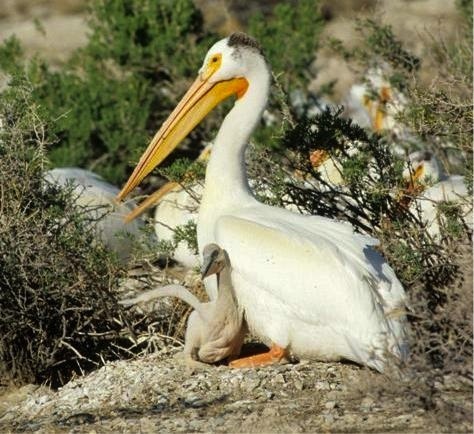 Today’s pelicans hatch their eggs on the island, and leave their young every evening to obtain food and fresh water in the marshes found along the eastern shores of the Great Salt Lake. The adult pelicans stay overnight on the east side of the lake and return the following morning to feed their young. Although an inhospitable environment with no freshwater, Gunnison Island provides a safe area free of disturbances to raise young pelicans. To make this trip, pelicans take advantage of rising warm air currents called “thermals.” As the warm air rises, the pelicans use these air currents to gain several hundred feet of elevation. Once sufficient elevation is achieved, the pelicans alternate between gliding and flapping their wings to cover the 30- to 100-mile distance between their feeding areas and the island, to provide their young with fresh water and a delicious, nutritious meal of regurgitated fish meat. Pelicans are particularly fond of carp. I admit it’s not very appetizing, but I can’t help admiring the dedication of these birds and their ability to develop such a unique survival strategy! 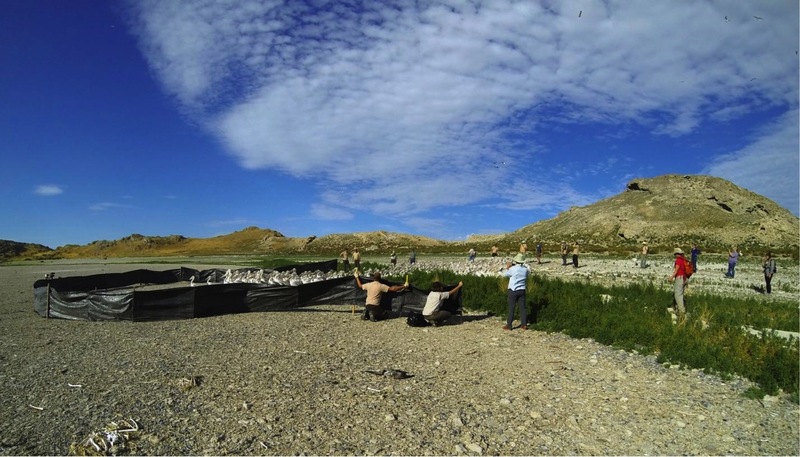 Utah pelican band recoveries have been reported throughout North America! A leg band is standard wear for any bird that is tracked, but the numbers are nearly impossible to read while on living birds. 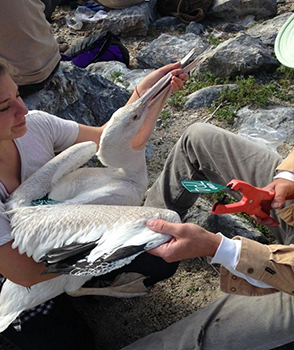 The wing tags allow biologists and citizen scientists alike to more easily identify and report encounters of tagged pelicans through the course of their lives. Encounter data can also help us determine other information about pelicans such as life span, nest site fidelity, survival rates, population estimates, age at first breeding and behavioral and social habits. Check out the Bird Banding Laboratory website to learn more about banding and why we do it. If you see a tagged pelican, we ask that you contact John Neill (johnneill@utah.gov) to report your encounter. Don’t forget to include important details such as when, where, who, tag color, code color and code. Photos are always appreciated. Also, please report your encounters to the Bird Banding Laboratory at reportband.gov or by calling toll-free 1-800-327-BAND (2263). Reports of Gunnison Island pelicans have come from 10 different states and as far away as Iowa, Texas, California and even Mexico.You may also see pelicans wearing wing tags with other colors. Sidenote: The only human inhabitants of Gunnison Island in the last 200 years include some enterprising individuals who attempted to harvest the bird droppings (guano), and a naturalist (Alfred Lambourne) who stayed from November of 1895 until he could catch a ride out in March of 1896 with some guano harvesters. 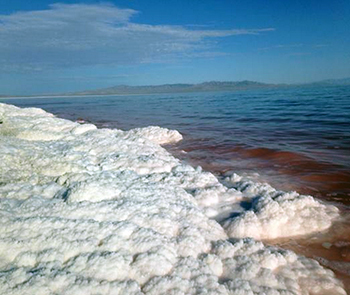 Sidenote: Over 75% of Utah’s wetlands are associated with the Great Salt Lake. Collectively, the Utah Division of Wildlife Resources, U.S. Fish and Wildlife Service, and Nature Conservancy manage nearly 150,000 acres of wetland along the lake’s eastern shore for the benefit of wildlife and the people of Utah. These areas are inhabited by a variety of fish and wildlife species, including the American White Pelican. Many thanks to DWR’s John Neill, Adam Brewerton and Russell Norvell for their contributions to this post, and the program.